The Kennebec Journal, which serves central Maine, ran an interesting story today on Gardiner’s (Maine) one way street (Water Street) through downtown. If you check out Gardiner’s picture gallery, you will see that the parked cars all face the same direction thanks to the one way flow of traffic. As a big fan of Jane Jacobs whose “The Death and Life of Great American Cities” spells out many features of good urban design–one-way streets were not one of them. Water street clearly needs to become a two-way street once again. One way streets invite speeding and actually make it more dangerous for pedestrians. While it may be a little cramped with two lanes of opposing traffic, one benefit will be to slow down traffic. The must continue to study this important issue. That being said, having recently been through Skowhegan, Maine . . . they a very unique traffic pattern through their downtown. While the traffic is one-way, it functions more like a traffic circle that goes around the downtown. Incoming traffic generally yields into traffic–except at one point which was found to be confusing and dangerous. Overall, this “traffic circle” system seems to work for them. It is nice that one could loop downtown over-and-over if you were looking for someone, or for parking, without having to turn around. However, surely an odd assortment of events came together over the years to create this unique traffic pattern. As such, it’s probably not something that could be easily duplicated elsewhere. 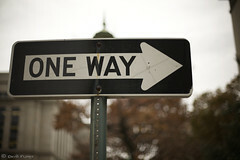 Nonetheless, it may be an exception to the rule against one-way streets.